Small groups transform churches-and lives. Small group leaders often feel the weight of shepherding their members. But who shepherds the shepherd? And what are the best ways to provide that support and guidance? These are the questions answered in Coaching Life-Changing Small Group Leaders. When you're called to coach a small group leader in your church, your mind may be filled with questions: Am I godly enough? What do I have to offer? How do I begin? Although the challenge seems immense, this handbook breaks down the work into reassuring and achievable steps. Originally self-published by Willow Creek Community Church, this expanded and improved edition offers field-tested and biblically supported advice on such topics as modeling a surrendered life to those you shepherd gaining the tools and wisdom you need for coaching helping leaders grow spiritually nurturing the spiritual development and support of leaders. For those who want to coach with excellence and truly help small group leaders thrive, this go-to guide offers practical answers and inspiring examples. You'll find both challenge and promise in these pages as you learn to carry forth your God-given calling with confidence. "We ask small group leaders to come alongside their group members, but often no one comes alongside them. This is a great tool from two people who have done exactly that for a long time. Small group leaders everywhere will benefit from this kind of coaching." 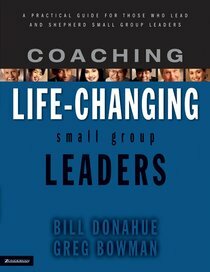 About "Coaching Life Changing Small Group Leaders"